January 6, 2015--Have added a new app to my page on the right titled "Favorite Apps and Tools". 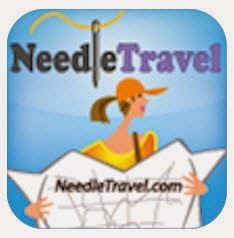 I just learned about this app called NeedleTravel while reading FaceBook's Needlepoint Nation posts . It's a free app (iPhone only) published by Syntress, LLC and just recently updated on November 3, 2014. It's a great tool when looking for needlework shops which carry items for needlepoint, cross stitch, embroidery, quilting, yarn, etc. You can also get the full address and telephone number of a shop as well as directions from your "current location". Cool. I only hope the designers keep the app current since shops come and go with an alarming frequency.